Sometimes, when you explore old buildings, the least prepossessing places still produce surprises. Wincobank, round the corner from the huge modern Meadowhall shopping centre, was very much a separate community from both Sheffield and Rotherham until well after the First World War. There were two railway stations, one called ‘Wincobank and Meadow Hall’, the other ‘Meadow Hall and Wincobank’, but electric trams never came near and the bus-service was sparse. Wincobank people looked for their entertainment to the 550-seat Wincobank Picture Palace, opened in 1914 and operated at least from the 1920s by the Wadsworth family, who also owned the nearby, long-vanished Tinsley Picture Palace. After the Wincobank Picture Palace closed in February 1959 it was used by a plumbers’ merchant, now operated by the Graham chain [http://www.grahamplumbersmerchant.co.uk/branch-locator/?location=Wincobank]. The outside of the building is in beautiful condition, but in the course of fifty-odd years of industrial use the interior has been heavily beaten up. The manager, Mick Adams, encouraged me to take a good look round, mainly because the balcony front, installed in 1926 to add a hundred extra seats, is visible and largely intact. Otherwise, the proscenium has disappeared and all the plasterwork from the walls has been stripped away, though the shallow barrel ceiling with its ventilators remains. The floor has been levelled and an extra level has been built out from the balcony, but it’s clear that the original raked floor and balcony flooring remain. 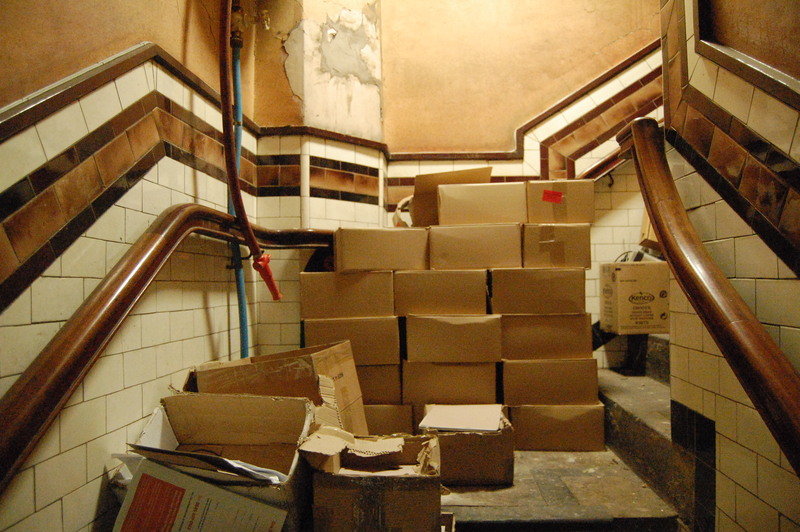 I did my best to contrive a series of photographs to illustrate my forthcoming presentation at Sheffield City Libraries, and then Mick mentioned the staircase that his staff don’t use to get upstairs. He opened a door by the front entrance, to reveal the original staircase to the balcony, now used only for storage, beautifully preserved and tiled in cream, brown and chocolate, with wooden handrails intact. It was like stepping back into the 1920s. Mick tells me that under the floor at the entrance there remains a mosaic design with the words ‘Wincobank Picture Palace’. This entry was posted in Fun Palaces, Sheffield's Heritage on March 30, 2015 by Mike Higginbottom. I first explored the surviving cinema buildings in Sheffield for the South Yorkshire Group of the Victorian Society circa 1983. I’ve been asked to give a presentation at Sheffield City Library, so I decided to do a further survey of what is left of the fifty-odd auditoria that were built in the city up to the start of the Second World War. One of the most attractive survivals – well cared-for though not intact – is the former Darnall Picture Palace, designed by Walter Gerald Buck and opened in 1913. Because the Darnall Picture Palace isn’t really in Darnall, and there was also a Darnall Cinema, locals called it the Balfour, because it was on the corner of Balfour Road, and by 1931 the proprietors were using that name in their advertising. 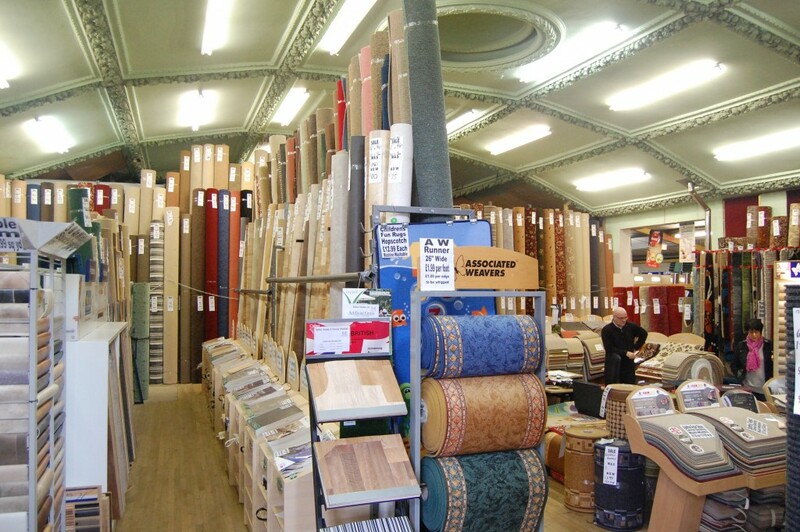 After it closed in 1959 the building was used by Clarks of Retford for their dry-cleaning business, and it’s now a quirky carpet showroom, run by a family firm as Balfour Carpets: http://www.balfourcarpets.com. The mock-medieval castellated exterior is a landmark on the main road, and the barrel-ceiling interior has particularly fine fibrous plasterwork. The sides of the proscenium arch remain, with faint traces of gilding, though the top of the arch has disappeared. There was no overhanging balcony, though in 1920 the auditorium was extended to provide a raised rear section. It’s difficult to discern among the rolls of carpets exactly how this was done. Ryan Jackson, one of the owners, who showed me round, took me upstairs to the staff room where there remains one of the hatches of the projection suite, still in situ. This entry was posted in Fun Palaces, Sheffield's Heritage on March 25, 2015 by Mike Higginbottom. I was privileged to be a guest when the Derwent Decorative & Fine Arts Society listened to a presentation about the 158 Squadron RAF Memorial on the site of RAF Lissett, by the artist Peter Naylor. The story of 158 Squadron encapsulates the sacrifice of the men of Bomber Command in the Second World War. 851 personnel of the squadron were killed while based at RAF Lissett. Across Bomber Command as a whole, nearly 65% of those who flew didn’t come back. Their average age was 22. They were all volunteers. Located on the East Yorkshire coast south of Bridlington, Lissett was the closest Yorkshire RAF base to Germany. It operated from February 1943 and was abandoned at the end of the War when 158 Squadron became part of Transport Command. 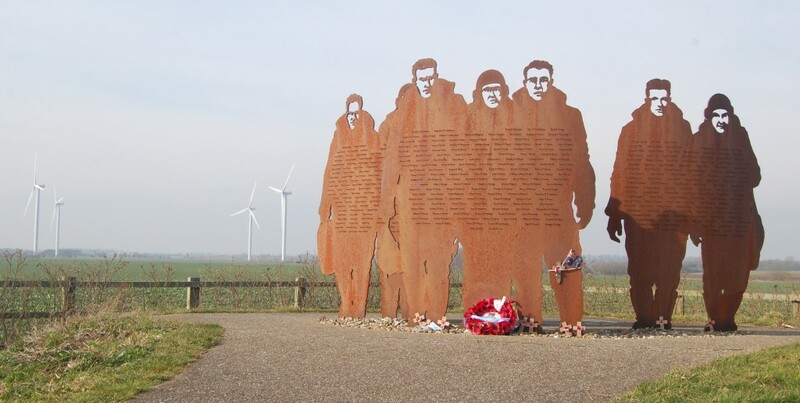 When Novera Energy PLC took over the site for a wind-farm in 2007, they agreed to finance a memorial to 158 Squadron, and the design competition was won by the Beverley artist Peter Wallwork Naylor: http://www.peternaylor.co.uk/public/158_Squadron_Memorial.html. His vision is a silhouette in 15mm weathering steel of a seven-man bomber crew, based on a photograph. The figures are eight feet high, and the composition is curved so that on the seaward, convex side, the men are marching out to fight, and on the landward, concave side, they are returning home – as so many of them were unable to do. On the steel are engraved the names of the 851 personnel who lost their lives, placed randomly rather than in alphabetical order, with the added phrase “And for all who served with 158 Squadron”. It’s a particularly powerful image to come across, driving down a quiet lane in the depths of East Yorkshire: http://www.158squadron.co.uk/158_Squadron_pages/158_Memorial.html. There’s a lay-by with informative interpretation boards. In the fields behind the memorial are Novera Energy’s twelve huge wind-turbines, made in Germany. This entry was posted in Life-enhancing experiences on March 19, 2015 by Mike Higginbottom. We live in an age when religious extremism causes conflicts that sometimes prove fatal. So it was in the seventeenth-century, when the repercussions of the English Reformation set Anglicans against Puritans to the point of civil war. At Staunton Harold, on the border between Derbyshire and Leicestershire, Sir Robert Shirley, 4th baronet, chose to build opposite his hall a new parish church that looks, for all practical purposes, as if it was one or two centuries earlier than its actual date. Sir Nikolaus Pevsner’s Buildings of England: Leicestershire & Rutland describes it as “completely Gothic, not simply a continuation of the Perp[endicular] style but Gothic in a more conscious and general way”. hoped them in the most callamitous. The righteous shal be had in everlasting remembrance. For his pains, the Commonwealth government imprisoned Sir Robert in the Tower of London, where he died in 1656. After the Restoration, the church was completed for Sir Robert’s heir, Sir Seymour Shirley, 5th Baronet (1647-67). The interior is consistently Jacobean with panelling by William Smith of Melbourne and a nave ceiling signed by Samuel and Zachary Kyrk and dated 1655. The communion plate dates from 1654. The wrought-iron chancel screen is slightly later, and thought to be by the ironsmith Robert Bakewell. Staunton Harold Church, which is Grade I listed, is now in the care of the National Trust: http://www.nationaltrust.org.uk/staunton-harold-church. This entry was posted in Sacred Places, Survivals & Revivals: past views of English architecture on March 13, 2015 by Mike Higginbottom. The term “Gothic Revival” is familiar to anyone with the remotest interest in architecture, but “Gothic Survival” is much rarer. There’s a splendid example of a Gothic church built after the Reformation but still in the medieval tradition at the end of Leeds’ main shopping street, Briggate, opposite the Grand Theatre. It was needed because in the early seventeenth century Leeds was expanding as a centre for the wool trade, and the parish church, St Peter’s, became overcrowded. 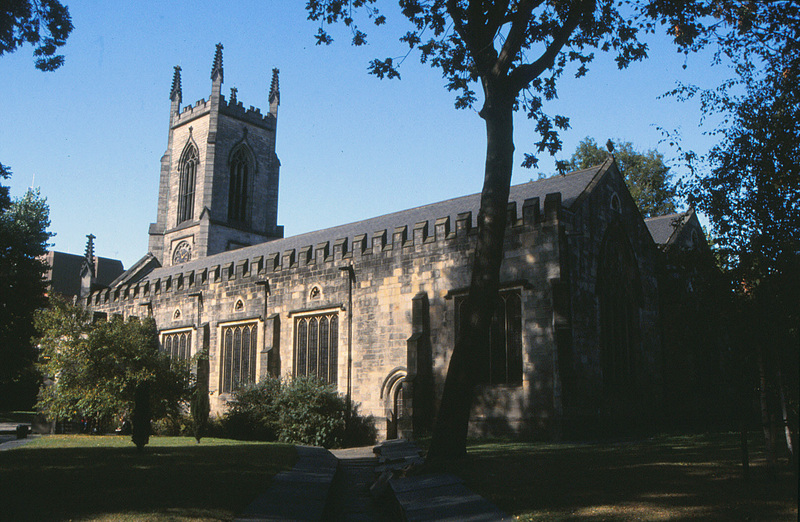 The church of St John the Evangelist was paid for by Alderman John Harrison (1579–1656), a cloth-merchant and much-loved philanthropist who also provided a market cross, alms-houses and land and a building for the Leeds Grammar School. Leeds’ first historian, Ralph Thoresby, notes that Harrison fitted his doors and wainscots with holes “for the free passage of cats”. When St John’s was built, 1632-4, it was fully a hundred years since church-building had been commonplace, and the folk-memory of the old masons had faded. The window-tracery is quirky, as if improvised, and the layout is odd: what might be the south aisle is the same size as the nave. This double nave, with a central arcade, was practical because the preacher was positioned at the centre of the north wall. An elaborate screen separates the chancel area, where communion was celebrated “as in times past”. St John’s looks superficially like a medieval church, but the panelling, the pulpit and the screens are distinctively Jacobean, with strapwork and obelisks, and the Royal Arms are those of James I & VI, who had died in 1625. In its layout and decoration, this was a church that followed the ritualistic principles of the then Archbishop of Canterbury, William Laud (1573–1645). The religious turmoil of the time flared up on the consecration day, September 21st 1634. In the morning John Cosin, chaplain to Richard Neile, Archbishop of York, preached a sermon in line with Laud’s principles. The same afternoon, the Puritan first Vicar of the new church, Robert Todd, in his sermon, vehemently attacked Neile’s views and was promptly suspended by the Archbishop. It took a year for John Harrison, and Sir Arthur Ingram of Temple Newsam, to secure Todd’s reinstatement. In the early nineteenth century there was a strong possibility St John’s would have been demolished. 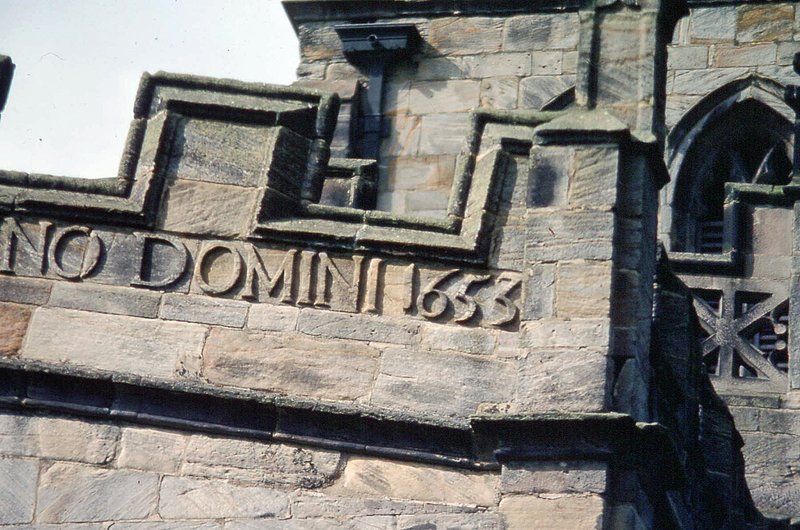 The south porch was in fact taken down, and the tower was rebuilt in 1838. Its rarity was recognised by the young architect, Richard Norman Shaw (1831-1912). He enlisted the great Gothic Revival architect, George Gilbert Scott (1811-1878), and between them they persuaded the Church authorities in 1865 that it would be cheaper to restore than to rebuild. The congregation has long since disappeared, and this Grade-I listed church is now maintained by the Churches Conservation Trust. It’s open over lunchtime from Tuesday to Saturday, and is a welcome haven of calm in the midst of the busy city centre: http://www.visitchurches.org.uk/Ourchurches/Completelistofchurches/Church-of-St-John-the-Evangelist-Leeds-West-Yorkshire. This entry was posted in Sacred Places, Survivals & Revivals: past views of English architecture on March 8, 2015 by Mike Higginbottom. The Sitwell family have lived at and owned Renishaw since the 1301. Of the owners who built and embellished Renishaw Hall, the one who aggrandised the house most was Sir Sitwell Sitwell. The male line of the Sitwells ended with the death of the second of two bachelors in 1777 and the property, said to be worth half a million pounds, passed to a nephew in the female line, the lively, musical Francis Hurt of Mount Pleasant, Sheffield, who took the surname Sitwell. Sitwell Sitwell, who inherited an income reputed to amount to £40,000 a year, immediately began extending the house with the help of the Sheffield architect, Joseph Badger, adding the pillars which widened the Jacobean hall, and in 1793 building the apsed dining-room extension with its chimneypiece by John Platt of Rotherham. Badger also constructed the Dairy, the Gothick Temple and other estate buildings. In 1803 the east wing was begun, including the drawing room, which contains the earliest plasterwork attributed to Sir Francis Chantrey and a chimneypiece by Sir William Chambers, originally in the Albany, Piccadilly, which Sitwell Sitwell purchased from the Duke of York. He erected the stables to the north-west of the house (also by Joseph Badger) to accommodate his racing stud, his hunters and the hounds which in November 1793 had famously chased and captured a “Royal Bengal Tiger” escaped from a nearby menagerie. The Prince Regent visited Renishaw with his daughter, Princess Charlotte, in 1808 and made Sitwell Sitwell a baronet. The ballroom, which contains another of the Albany fireplaces, was completed for this occasion: its ceiling is embellished with the Prince of Wales’ feathers. Sir Sitwell Sitwell died, of gout or of its treatment, aged 41, in 1811. This entry was posted in Country Houses on March 2, 2015 by Mike Higginbottom.